Chiefs’ Houston getting close to return, but is it worth it right now? 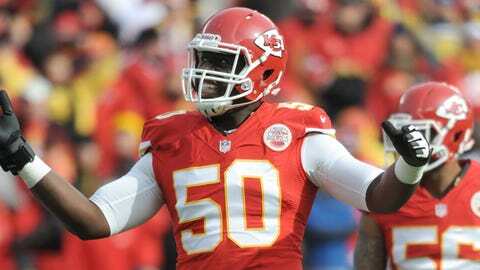 Justin Houston is practicing with the first team, but that doesn't guarantee his availability for Sunday. KANSAS CITY, Mo. — It is going on four weeks since the Chiefs had arguably their biggest defensive weapon on the field — linebacker Justin Houston. But whether Houston, who suffered a dislocated elbow Nov. 24 against San Diego, plays before the playoffs begin remains to be seen. Houston practiced last week with the Chiefs’ scout team, and he has been taking reps with the No. 1 defense this week. But that’s no guarantee Houston will suit up for Sunday’s game against the Colts, or even the regular-season finale against San Diego. The risk might be too great. 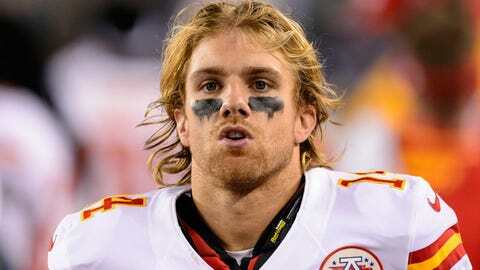 "There’s risk versus reward," Chiefs defensive coordinator Bob Sutton told FOXSportsKansasCity.com. "We need him fully healed and we need him 100 percent. That’s the position we’re in. "I don’t think we’d ever jeopardize him." Houston has made strides in the last two weeks, practicing with a brace to protect his left elbow. "I think he’s really close," Sutton said. "He’s practicing with the first team. But it’s (a medical decision)." The question the Chiefs’ staff is pondering is whether Houston truly needs the game snaps to shake off any rust. They could just continue to let him heal and be 100 percent, or close to it, for the playoffs. "You’d always prefer to get the game reps in," Sutton said. "Any player will tell you he benefits from knowing how he fits in with what he can do. There’s a comfort level knowing how you’re moving. "The flip side is that he’s played enough plays this year and enough in his career that I don’t think it will be a detriment to him (by not playing). If he had his preference and if we had our preference, he’d be out there playing (in a game). That’s what he would like." Houston was having his best season as a pro, notching 11 sacks through the first 11 games. Frank Zombo has filled in and performed admirably, registering a team-high seven tackles last week along with an interception. Zombo also had a sack the week before. But there’s no replacing Houston’s brute strength, athleticism and play-making ability. The good news for Chiefs fans is that Houston apparently is getting closer to his normal routine. "I give him credit because he’s preparing and practicing like he’s playing this week," Sutton said. "That’s the most important thing. That’s the mindset you need, to be preparing mentally for the game plan and everything, do the little things like studying your opponent, critiquing yourself … all the things you don’t get to do when you’re sitting on the sideline. He’s preparing and practicing like he’s playing this week. "That’s a real positive thing." If Houston does play against the Colts, he will do so with a protective brace that will take some getting used to. "Those guys all have to use their hands and arms to pass rush," Sutton noted. "So, he has to get used to pushing with it, get comfortable (with the brace). It’s there to stop anything negative from happening. "But it’s different than not having a brace. That’s why playing (in a game) would be beneficial to him." But is it worth the risk right now? The Chiefs already have a playoff spot clinched. And while they still have a chance to win the division and claim the AFC’s No. 1 seed — if they win out and the Broncos lose once — the Chiefs will have to weigh that risk against the odds of Houston getting re-injured and possibly losing him for the season.